Appropriate architectural style for homes in the Village includes traditional American and European designs from the 19th century and earlier. Design details must be consistent with architectural style. Additions and other improvements must be designed to be "seamless" meaning that they must appear to have been built as part of the original structure in the same architectural detail, and appropriate scale, balance and proportion. New construction must utilize architectural style compatible with that of existing Village homes in order to blend into the neighborhood. Refer to Style Groups and A Field Guide to American Houses by Virginia & Lee McAlester for information regarding acceptable styles. The home's mass, scale and height are to be appropriate for the site and in harmony with the mass, scale and height of adjacent homes. 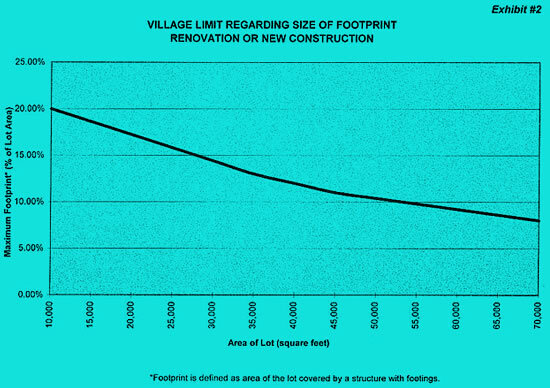 The maximum allowable footprint for new construction or home renovation is based on the size of the lot and expressed as a percentage of the lot's square footage. Footprint refers to the area of the lot covered to the extent of the structure's footings. See Exhibit #2 to determine the percentage of the lot which may be built upon. The mass of home is to be focused in main structure and secondary elements should be of lesser height and mass. These Architectural Guidelines do not set a limit on maximum roof height, but the Board of Trustees strongly encourage roof heights (measured grade to peak) which maintain harmony with the balance, scale and proportion of existing Village homes. When reviewing a proposed roof height, the Board of Trustees may consider, among others, some or all of the following factors, both with respect to the proposed residence and other homes in the immediate area: (1) architectural style of the house, (2) eave height, (3) ridge height, (4) lot elevation, (5) distance between houses and (6) applicable building code requirements that may affect overall height. If an architect, developer, or homeowner anticipates their proposed residence will have an absolute roof height that is significantly higher than those of other homes in the immediate area, the Trustees strongly encourage preliminary discussions between the interested party(ies) and the Village Manager. These discussions should take place when the home design is still in the concept stage. Front and side setbacks vary depending on a lot's location in Bloomfield Village and the deed and building and use restrictions which apply to the lot. Roof pitches of main structure, wings, and dormers are to be consistent or complementary. Roof pitches and facia trim to be appropriate for the architectural style of home. Roof styles (hip, gable, etc.) to be consistent and/or complementary throughout the structure. One roof material of consistent pattern, texture and color, is to be used except for accents (i.e. copper bays). Frames shall appear to be of wood (may be clad), and of high quality appearance. Scale of frame to glass area shall reflect historical proportions. Windows on all elevations shall include muntins. Window designs to be complementary and consistent throughout the home. Window size to be of proper scale to home. Window placement shall make all areas visible from the street appear to be living area, including the garage. Window placement to be balanced and purposefully integrated into design. With few stylistic exceptions, window muntins should be light in color to both articulate and contrast with the dark appearing glass so that these horizontal and vertical elements give scale to the windows. Main entry door to be of traditional design, consistent with style of home and appear to be of wood construction. Service doors at side and rear to be compatible with design of home. Shall be of traditional design and material, and complementary with home design. Lamp posts, if used, to be consistent with lighting on the home. Low level garden/pathway lighting is permissible when part of a landscape design and mechanics are discreetly installed. Installation of a satellite dish antenna requires approval by the Board. The antenna must be hidden from view of the street and be of a neutral color. No large dishes (over approx. 18") will be allowed. Shall be of traditional appearance and color that suggests an historic origin. Shall be consistent with design theme of home. Where the exterior is other than brick or stone, the exposed foundation is to be brick or stone from front, rear and side elevations. This guideline is intended to include brick with natural coloring, natural stone, clapboard made of wood or quality substitutes, stucco and half timber or quality substitutes, board and batten, and painted brick. This guideline is intended to exclude the use of reverse board and batten siding, plywood and rough sawn siding and trim. Chimneys must be of traditional construction and faced with stone or brick in a manner consistent with existing chimney(s) and the style of the home. Prefabricated chimneys faced with siding will not be approved. The use of pediments and other exterior details is encouraged to enhance the appearance of each home and to provide opportunity for variety in home detail. The use of shutters is required in most cases. Architectural details should emphasize historic design. Front yard accessory structures such as lighting piers, gates, fences, and walls will generally not be approved. Additions must be designed to appear "seamless", meaning they must look as if it were built at the same time as the original structure. Conformity to lot line set-backs is necessary unless a variance from such set-back is obtained from the Bloomfield Village Board of Trustees and Bloomfield Township. Many residents have requested fences in the past, citing issues regarding privacy and security concerns. State law requires fences to be around pools, which are permitted in the Village. Such fences should enclose the pool, not the entire yard. Although in the past, some fences enclosing more than just the pool hae been permitted, they are generally, and in most cases, overwhelmingly discouraged. The exceptions usually dealt with unusual lot configurations. The Board of Trustees believes fences detract from the development of the Bloomfield Village Association into a beautiful harmonious private residential section, which is the purpose of the deed restrictions that apply to each lot. The use of fences is overwhelmingly discouraged except where required by Bloomfield Township. Trees, shrubs, and plants are the preferred choice for providing privacy and screening. If a fence is approved, it shall be black "wrought iron" style. If any chain link or other non-conforming fencing is replaced, it shall be replaced with a black "wrought iron" style fence. With the exception of pool fences, a fence may not exceed four feet in height. Pool fences may not be higher than permitted by Bloomfield Township. Landscaping should be used to soften the appearance of fencing. Front yard fencing will not be allowed. Play structures should be placed so as to conform with set-backs and to minimize view from street and neighbors. Landscaping will be required to screen the view. Height and size should be compatible with lot size, available space and set-backs. Garages shall be attached to the primary structure through a significant portion of a common wall, and rear entry garages are preferred. No front entry garages will be permitted. Extreme site limitations exist which restrict the use of a rear entry. Methods are utilized to minimize the view of the garage entrance from the street and neighbors. Adequate evergreen landscaping material is used to screen the view from the street and neighboring property. On corner lots, the garage shall be located to minimize view from adjacent properties and evergreens may be required as a supplemental screen if appropriate. Only one sign per address shall be displayed at any time. The maximum sign size is three feet square. Signs shall be of temporary usage only ("For Sale" and "For Lease" only). Contractors' signs are not permitted. Pools, hot tubs and decks shall be located to minimize the view and noise from adjacent properties and approval of same is required by the Board of Trustees. Evergreens may be required as supplemental screening, if appropriate. Deck materials, finish, and design shall be complementary to the home. Circular driveways are discouraged in most sections of the Village since they are inconsistent with the vision to maintain an open lawn with a pleasant vista undisturbed by detractions. Parking areas, other than a driveway, may not be constructed in front or side yards. Paving of street right-of-way with any material including brick, rock, stone, concrete or asphalt may not be done except as needed for driveway access and sidewalk. Paving of driveway should be limited to that which is required for ingress and egress and any additional paving for the purpose of parking is not allowed. Maximum driveway width is twelve feet in the front and side yard. Repair and replacement of driveways are subject to review and approval. Every effort must be made to preserve existing mature trees and shrubs during new construction or renovations. The homeowner must submit preliminary landscape plans together with architectural plans for Board review for the project. New landscaping is required to be sufficiently large as to blend with the established neighborhood. Ground Mounted Mechanical and Electrical Equipment, referred to as GMMEE, includes, but is not limited to air condition condensers and permanently installed auxiliary electrical generators. GMMEE are considered auxiliary structures. GMMEE cannot be placed in front yards. On corner lots, GMMEE can placed in the secondary front yard if they are screened as set forth below. GMMEE may be permitted in the side yard provided they meet the side setback requirements. GMMEE located in the side yard, or secondary front yard, must be screened from view through the use of evergreen plant material at least the height of the equipment. Evergreen plant material used in a screen wall must be maintained in a healthy condition. GMMEE must meet the setback and noise requirements of Bloomfield Township. If all of the above requirements are met the Village Manager may, in his or her discretion, grant approval without referring the matter to the Board. The Bloomfield Village Deed Restrictions require prior approval of changes to the exterior color scheme of your home. If an exterior color change is planned please contact the Village Manager prior to proceeding. In most cases the Village Manager may, in his or her discretion, review and approve a color change if color samples are provided. It is recommended that any color changes are evaluated by painting samples on the house to view in a large area and in different light conditions. Any change considered to be non-harmonious or precedent setting will be reviewed by the Board. Repainting the house, including siding, trim, shutters, doors, windows in the existing color scheme is considered a repair and does not require prior Association approval. All the above stated guidelines are applicable to and will be required of new construction. The design, scale, height, mass and materials used in new construction must be consistent with other Village homes of similar style in order to maintain the traditional nature of the Village. Many original house plans are on file at the Village Hall, and it is recommended that the homeowner and their architect review these plans in order to achieve conformity with architecture used during the time the Village was developed. The Village was developed in twelve sections that each have different lot sizes and character. Therefore a home that is appropriate in one location, may not be equally appropriate in another. Additionally a perfectly good traditional house design may be appropriate for neighboring communities but would not be compatible with the original homes in the Village. Please see Style Guides which provides further detail regarding architectural styles that are considered appropriate. The home must be positioned so that the front is parallel to the street in a manner which is consistent with the neighboring homes. Construction of a new home must be completed in one year to minimize the disturbance to neighbors.